We regret to announce that as of September 2008 we are no longer available for performances due to many members leaving the region. 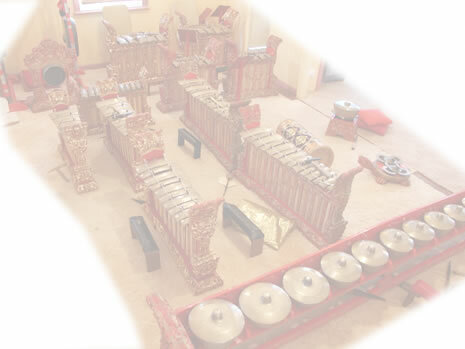 We would be very happy to receive your emails about gamelan in general, and we redirect you to the 'links' page for information about other gamelans in Australia and overseas. Membership is open to all members of the community of any age or musical background & tuition is available to new members. The membership base continually changes as members move to new jobs or study outside of Toowoomba etc. so there is always the opportunity for new members to learn & perform the music. As the group is a non profit organization no payment is made to members except for reimbursement of expenses. All monies raised from performances, membership etc. go towards the clubs expenses such as insurance, council rates for the club house, maintenance of the instruments etc. Membership fees are $20 per year ($10 students/unemployed) & a rehearsal fee of $2 per week goes towards the general expenses of the club house. Rehearsal are held at 3 Cress Street Toowoomba at the Gamelan's club house which was purchased in 2000 and renovated by club members.